The Red Sea is located between Asia and Africa. Its most northerly point forms the Sinai Peninsula and from there stretches over 1000 miles south to join the Indian Ocean, between Ethiopia and Yemen. The Red Sea holds beneath its crystal blue surface an oasis of living creatures, reefs and coral formations with some of the most spectacular diving in the world. The Red Sea really is a one of a kind place and should not be overlooked by any diver, no matter what your experience level. 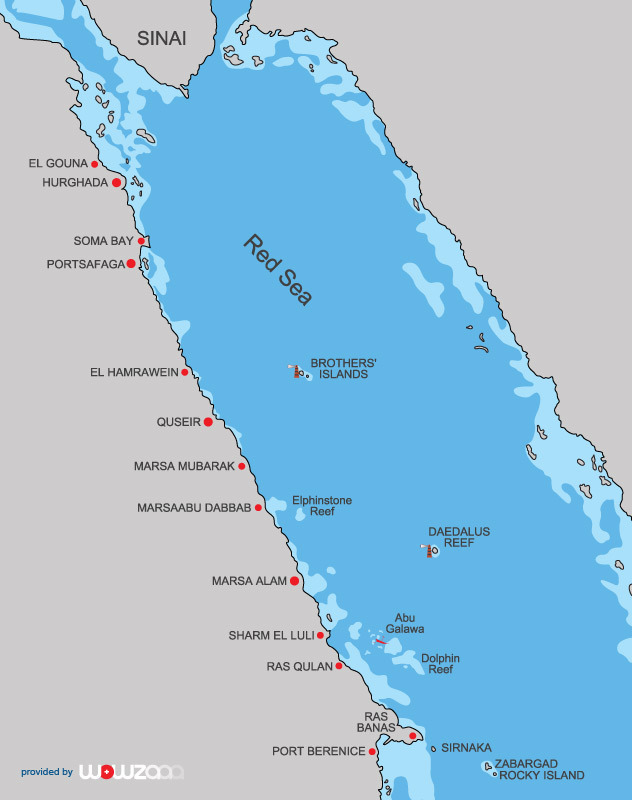 Thanks to its geography, the Red Sea is warm all year round and virtually enclosed – which has enabled a totally unique marine ecology to develop. There are species found here that no other patch of water can offer, along side some of the more typical fishy favourites. From the smallest macro life, through to turtles, eagle rays right up to the apex predators and even whalesharks, diving in the Red Sea is never dull. Be you on a lavish coral reef or a heavenly wreck, every dive is different yet always packed with nerve tingling moments you will treasure long after your tan has faded.